This week's theme is "Share a Summertime Memory". I am sharing two of my favorite memories. The first being (and will always be) fishing. I've loved to fish ever since I was big enough to hold a pole. The second memory is my Grandpa & Grandma's cottage in Kentucky, where we would go every Summer. I loved that place more than words can describe. Now a days, kids probably would hate the place though, because there were no television and no phone... just the outdoors and evening-family-time. Did you, as a child, have a special place that seemed to have its own smell - it's own atmosphere - it's own unique feeling that enveloped you when you were there? The cottage was that place for me. First.. you look SO darn CUTE in that picture!!!!! Awwww! Yes, you look quite happy! Holy mackerel or should I say holy bass!!! 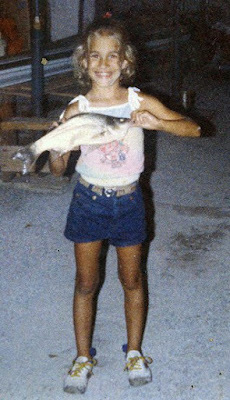 Wow, that is one big fish for a little girl! Little Misty is so cute! Yep, you do look happy. Most of our fishing was at a pond across from our house. There were so many bluegill in that pond that none of them were very big at all. Cute. You look so proud. Now that's a great fish and a wonderful memory! Thanks for sharing. That's a great fish, and you have that, "Look what I did all by myself" look going. Atta girl! I think you look VERY happy. What a healthy, suntanned happy kid you were! Great photo and memories. I couldnt hold a fish like that- far too squimish!! ha!